Keep reading to find out how you can earn up to $75 per hour as an online tutor...using our exclusive virtual classroom with step by step training from professionals who have been tutoring students online since 2003. Since we started online tutoring over eight years ago, we've been bombarded with tutor applications and people begging us for online tutoring jobs. After careful consideration, we decided to give you exactly what you want! This is so much better than a normal tutoring job. This is your opportunity to start "your own online tutoring business" where you can earn a definite part or full time income from home. You'll get unlimited personal support for your business and by reading below, you'll discover how to have access to exclusive parent leads who are interested in paying for your online tutoring service. Warning - Only 1 Tutor Allowed Per City - Slots are Going Fast! TutorFi.com Was Created For You! This ground breaking concept was developed with you in mind. "Let tutors teach as he or she sees fit while accessing the most advanced learning tools online. This business model allows tutors to profit from home with virtually no limits." That's why there's no software for you to set up and no equipment for you to buy or maintain. We handle all that technical "backbone" stuff. It's all on our dedicated servers and maintained by our software engineers. That means you don't have to worry about any of it! It really is simple. All you do is login and start tutoring. No metal detectors... no unruly students... no squeaky chalk. This freedom means you can now tutor from anywhere! Let's take a look at the marketplace you're about to enter. Live online tutoring companies based in the US charge their clients between $25.00 and $75.00 per hour. You put in just two hours after school, three days a week. That's only 24 hours a month from the comfort of your own home. Not even enough time to make it feel like work. In one school year, you've just made yourself $8,400.00 in extra income. That's with the summer off! What if you charge $75.00 per hour? You've increased your income to $16,200 in only nine months. If you decide to continue on the same schedule through the summer, this balloons to a whopping $21,600! You can even go full time with this if you want. Now you see why this is such an exciting opportunity for you. It doesn't matter if you're currently teaching school or NOT. Even if you're not a teacher or never tutored before, this could be exactly what you are looking for as long as you have an understanding of a particular subject and a passion for helping students learn. Just 24 hours a month could bring you over $21,000 in extra income every year. What could you do with that kind of found money? Whatever your dream is, you can have it! Today's children are being let down by the educational system, budget cuts, and sometimes even lazy parents and exhausted/frustrated teachers. As you may have noticed, education these days is a world away from what it was when we went to school. Today's student is burdened with overcrowded classrooms, violence, and general apathy: all the obstacles that inhibit learning. The sad part is that teachers are taking the blame. I am here to tell you it's not their fault! Teachers are handcuffed by regulations that control how they teach children who, in some cases, don't even want to be taught. Ask any teacher and they'll agree that the No Child Left Behind Act has devastated the educational system and put immense pressure on the teachers. Teachers are now being forced to teach for the test instead of teaching the regular curriculum. This means more and more students are getting lost in their classes. They need help! It's also getting harder to get through to kids today with all the video games, Ipods and other forms of stimulation they encounter on a daily basis. Parents understand this more than anyone else and this is why they're at their wits end! For many parents, online tutoring is their last resort for trying to help their sons and daughters gain confidence and keep up in school. This puts you in a great position. What if I told you there are students of all kinds just waiting for you? Would it excite you to know you can have parents lining up to pay for your online tutoring service every month? When I was growing up, I dreamt of becoming a Health & Physical Education teacher. I loved helping kids learn and feel good about themselves. While in college, I was excited and proud of what I was about to become. For the first two weeks of my student teaching experience, I was instructed to observe my mentor teacher, Mark. He had been teaching for 22 years and currently taught gym and health classes to 7th, 8th and 9th graders. When I looked at the grade book, almost every student was receiving an A in gym, but I was shocked to see that 1 in 4 students were "failing" their Health class and another 1/4th had a D average. This concerned me very much and when I asked Mark about it, he blamed the student's poor grades on laziness. I decided I was going to be an inspiration to the failing students and help them turn things around. I devised a plan and began teaching class in a more exciting way. Each lesson was interactive. We had class discussions and I constantly called on students who were not paying attention. The next few weeks were a struggle! I tried reaching out to several of the failing students and I even spent time with a few before & after class. I was trying to boost their moral any way I could. Many of the students thought of themselves as failures and would not even attempt to learn the information I was teaching to them. Even when I called on them in class, most disinterested students would just say, "I don't know". I was growing more impatient by the day! After three weeks of teaching, I felt like a complete failure. It seemed as if there was nothing I could do to help these students learn unless I taught in a completely different way. Clearly, my teaching tactics were NOT working. During a long day of teaching, I decided to ask all of my afternoon students (about 100) how I could become a better teacher. I actually walked around the class and spoke with students individually and in small groups. During these discussions, I learned most students stop paying attention after about 20 minutes. Most students told me they just got bored in the classroom. Some joked with me about creating video game lessons and some were literally playing hand held video games when I came around. All liked the idea of learning in the computer room when I presented this idea. I then asked Mark if I could reserve the computer room for the next health lesson. Looking back on it now, this one decision to try something new changed my perspective on traditional teaching methods and my future as an educator. What I discovered during my student teaching experience is that traditional teaching methods don't work for many of today's kids. After I moved my class into the computer room, the "non interested students"started to become confident, happy and enthusiastic with a simple lesson I created using Power Point. This slight, but noticeable spark of interest encouraged me. As my student teaching experience progressed, I spent extra time at home preparing online tutorials. I taught my last few health classes using some other online tools and the students absolutely loved it! Even those students who were “too cool” or “too shy” started to participate in class. Most students actually enjoyed my computer room lessons. When my student teaching experience was over, I helped most of my 7th, 8th and 9th graders pass health without any grade curving. After graduating college, I realized my life long goal was about to become bigger than I ever envisioned before. Today's students are overly stimulated by television, Ipods, video games, and most influential...the Internet. Imagine how focused you would have been on your schoolwork if you had these distractions to deal with everyday. You probably agree with me and understand that things need to change. I took my passion for teaching children and created a uniquely effective, personal online tutoring solution. In the summer of 2003, I spent long hours consulting with programmers, researching different technologies and working to create an online learning system designed to get students excited about learning. After about six months with minimal sleep, it was complete! I'm talking about a real, honest-to-goodness, interactive, "virtual classroom." A place with all the tools a tutor needs to do their job without the distractions found in a brick and mortar school. From my passion, Ehomeworkhelp.com was created (see front page newspaper article below). Our technology was so new that our small town of Indiana, PA picked up on us quick. In late 2003, I bought out my former partner and moved away from a homework help service to create live-etutor.com in 2004. Soon after this, we mastered the art of acquiring clients in this new "exploding" online tutoring industry. Over the next year, I learned a lot and was ready to take my online tutoring business to the next level. As an attempt to focus on a national branding campaign, in 2005, I created a new company called Owl Online Tutoring Inc. OwlOnlinetutoring.com was created with my small but dedicated team as we began tutoring a handful of students in a brand new way. We focused our time following up with parents and making sure their son's and daughter's were improving grades, attitude and confidence with our online tutoring service. With the new Owl online tutoring company this marked the first time we focused on over delivering to the parents and taking the time to care. This concept grew fast (to fast for us to handle) and now parents were begging to have their son's and daughter's tutored online with a "caring tutor". You're about to discover how we can work together to update today's traditional teaching/tutoring methods and earn a great side income while doing it. "We had our doubts about online tutoring. After a quick review with our tutor, my son was easily able to ask homework questions by speaking and writing on the online whiteboard which is just like a chalk board. Now my son gets homework help on his own without my supervision. I love ehomeworkhelp.com’s service." "My daughter was having problems keeping up with her math school work. Her grades were falling fast. After using ehomeworkhelp.com's service for 2 weeks, not only is she keeping up with math, but she also got her first A of the year." “After Mike watched the virtual tour, he begged me to watch and pay for his first tutoring session with live-etutor.com. I called them directly and after my free phone consultation with a tutor who really cared, I enrolled Mike and ever since then, his grades have improved. He got an A on his first Geometry test." “Manuel was about to flunk 11th grade Biology and Algebra, but we didn’t give up on him. Instead, I found live-etutor.com and my son instantly loved it. His tutor helped with Biology and Algebra. We love this service so much that our son is using it again this year." "I had my daughter use other online tutoring services, but she had difficulties communicating with the tutors and they were very expensive. Now she learns from an owlonlinetutoring.com online tutor every school night before bed. Communicating has never been easier and Susan loves her tutor. This new concept is fantastic." "This is exactly what my son needed to prevent him from falling further behind. He has been meeting with his own online tutor 2 times per week and his grades have drastically improved. This truly is the miracle I was praying for! Owlonlinetutoring.com has over delivered. My tutor really cares about my son's success." With our newly adapted caring attitude, we were swamped with emails from parents, students, and even teachers from all over the world. I heard from an art teacher in Milan and a math student from Toronto, parents in Manhattan looking to give their 3rd grader an edge, and a 27-year-old man from California who wanted to learn how to read in the privacy of his own home. I found people from every walk of life wanting to give me money, in some cases A LOT OF MONEY, so they could learn what they couldn't learn in a classroom. I soon realized there was no way OwlOnlineTutoring.com could ever meet such a great demand. (Click Here to view my original OWL Video I shot in my basement. This video helped explode my online tutoring business) The whole industry... the one we all but created... had grown to monumental proportions. Each tutor will ONLY care the most if they get to work with the same students each time and they have a stake in their own tutoring business...unlike all the other fly-by-night companies I see operating in tutoring online today.Â The key here is personal support from other experienced online tutors helping them every step of the way. After training, the tutors would know how to give the best service necessary to sustain a long term tutoring relationship with the student and parent thus creating a steady monthly income. We just wanted to provide the classroom where tutors could teach with all the tools and get the support they needed to be successful. In the end, the students, parents and tutors would all be winners. Caring tutors with proven marketing and support...using the most advanced online tutoring software to make a difference in the lives of students around the world. As I mentioned earlier, students today are not like you and I were at that same age. They are stimulated in an entirely different way. To kids, most books are now considered antiquated and bring up feelings of nostalgia. Reading is something they only do with e-mails and text messages on their cell phones. But even those students who do read are not "getting it." Experts say that children today only retain 20% of what they read in a book. But if they see it on a computer screen, game boy or TV, that statistic jumps to 50%. Students - especially those who are struggling - need to see it "on screen"! That's why stimulating the learning process in an entertaining way by using multimedia has become more critical than ever. This puts you in a great position! You'll be able to do what private tutors and teachers have been struggling with. And that's what makes our system so unique -- so perfect. Our interactive, sight and sound approach works like nothing else. Can this technology really make that much of a difference? "Multimedia is a powerful and efficient source for acquiring learning resources." According to Don Menn of San Francisco State University,"
"interactive multimedia--properly developed and properly implemented-- could revolutionize education. According to R. Mayer (Educational Psychologist, 1997),"
"When applied to multimedia learning, generative theory presumes that mixed modes of delivery affect the level at which learners employ cognitive processes to acquire knowledge." In just a couple of minutes, you're going to get a peek into a virtual classroom in action. But first, let me show you how well your classroom of the future is equipped. We start with file sharing. Through our POP server, you and your student can easily send files back and forth. This means she can send you her latest history exam, and you can send her lesson plans almost instantaneously. We add full duplex 2-way voice communication. This means you and your student can talk to each other just like you're on the telephone. This happens in real time even if you're dial up! Then we tap into cutting edge whiteboard technology. This allows both you and the student to draw or type in any color you wish. You share this whiteboard and you're now interacting in real time! Math and Chemistry homework becomes a breeze. This whiteboard - like a virtual blackboard - adds the visual component to the learning process that so many experts believe is the key to academic success. Here's the best part. The entire tutoring session can be printed out so your students (and you) don't have to waste time taking notes. This leaves more time for teaching and virtually no post-class paperwork on your part! "...the nationwide tutoring market has more than doubled in the past five years with about 10 to 12 percent of students, more than 6 million, expected to receive tutoring this year alone." "...Increasing the ways students receive help should increase success rates. As the college moves towards computer based instruction, and eventually online courses, the need for online math tutors will increase." A few minutes ago, I mentioned that you didn't even need to be a teacher to make this work. It's true. This system is ideal for anyone who loves to tutor, including parents, college students or anyone who likes helping students learn. You could use your personal classroom to teach any special skill any other person is willing to learn. Whatever your passion...you are now free to teach it how you want to teach it. The audio component is ideal for teaching languages, music or voice. Maybe you can help create the next big music star! The visual component along with the file sharing capabilities is perfect for teaching creative writing, art, technical drawing, or even architecture. You can help mentor the next Frank Lloyd Wright... even if he or she lives thousands of miles away! You can use all of our multimedia components together to tutor in real estate, teach home improvement, or give personal self-help sessions. Again, this system allows you to break down all geographical barriers! You are limited only by your imagination and your passion. You can teach just about anything with this system. You've stayed with me this long. You're probably wondering how much such a great opportunity is going to cost. It's definitely not as much as you think. But before I tell you, please take a look at a demonstration of our virtual classroom in action. Just click below to watch a real online tutoring session. You have the controls to tutor, manage and schedule your students with the click of a button. After reading this far down my website, I am certain you have the vision. You can see what the future holds and how that future allows you virtually unlimited profits, all while helping students and creating more proud parents. I hope you understand your opportunity is here and now. At the present time, there isn't a lot of competition. Within a year's time, dozens of new online tutoring companies will be entering the market. Saturation is certain at some point. My team and I are offering you an online tutoring business that will allow you to build a steady group of clients who will gladly pay you every month (including summer time) for your tutoring services. I mentioned earlier that there are costs to starting your own online tutoring business, but not nearly as much as you might think. Your own virtual classroom where you and your students can meet for tutoring sessions. Use sight and sound to earn up to $75.00 each hour ($25 minimum) while helping each child. Video training guaranteed to help you launch your online tutoring business fast. Our 27 videos (more coming soon) will help you understand every aspect of running a successful online tutoring business so you can earn money now and for years to come! Unlimited 24/7 email support. Have a question running your own online tutoring business? Just drop us an email and you'll get a response within a few hours in most cases. Have a question about teaching? You can email me personally! This kind of special attention cannot be found anywhere else at any price, but you get it included free just for being part of the TutorFi family. Your own scheduling & management system. Create student accounts, pre-set your schedule, automatically email your clients and present a professional appearance to your clients every time they login for an online tutoring session. Microphone tech support will configure your student's microphone so you don't have to. If you ever tried any other online classrooms, you know setting up the microphone can be hard work. TutorFi makes speaking online easy for you and your students. Just have your students call our 800#. You won't have to deal with any of this technical stuff. Note: Microphone set up only takes one phone call to tech support. Chat with other online tutors like you inside our members forum. Ask questions and get answers from our community of online tutors and TutorFi leaders who've been there and done it. Our experienced search engine optimization team will create your website and get you top positions for your local area in Google, Yahoo and Bing. This means that parents who are looking for tutors will find and contact you. 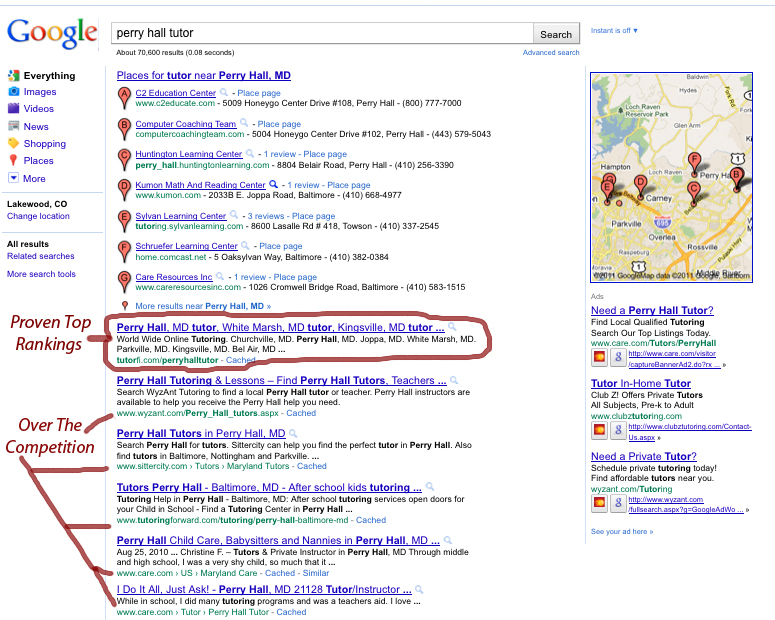 Click Here to see an example for our Perry Hall, Maryland tutor. Hiring a search engine optimization team to get you front page listings costs anywhere from $750 - $15,000. We're able to provide these positions to you as part of your low monthly membership because we've invested so much in our website our content and our tools over the years. One of our earliest tutors stumbled on the easiest method we've ever seen to generate local tutoring clients and earn money quickly. It cost under a hundred dollars for unlimited ongoing clients. And you can get it working for you in just a few hours. This drop dead simple method of generating cash in hand clients will take you less than 12 minutes to discover on this bonus audio. Even though you might think it's difficult to get the major newspaper in your city or town to publish your online tutoring story and give you free publicity, you'll be shocked when you see how easy it can be to land on the front page to take your online tutoring practice to a new level. Your name will be the talk of the town and parents in your neighborhood will know who the fun, trusted and caring tutor is in their community. Soon, all your neighbors and friends you have will not only believe in you and the online tutoring service you provide, but they won't be able to help themselves by going out of their way to ref err your service after being seen in your newspaper. Sign me up, Scott. This is just what I was looking for! Say you tutor part time of 80 hours per month. For each hour you tutor, you could potentially earn $73.75 for yourself, and only pay $1.25 for operating costs. This means your total operating expenses are around 1.6%. If you tutor 80 hours next month (which comes by simply tutoring 20 hours per week), you pay only $97.00 (TutorFi's monthly fee) for all 80 hours. That means you can earn up to $6,000 and only pay $97.00 in operating costs. Even if you low ball your online tutoring service and only charge $25 per hour and only tutor 10 hours per week, you can earn $1,000 per month while paying a measly $97.00 for operating costs that include our tools & support. Even these cheap online tutoring prices can bring you in an extra $12,000 per year in your spare time. And you're doing it from home in your pj's or wherever you have an Internet connection! You Can Even Make $112,000 Next Year While Tutoring Just 30 Hours A Week! It took quite a bit of convincing, but I've secured for you an interview with a TutorFi online tutor earning more than $10,000 per month (more than $120,000 a year). I can't reveal her name. She swore me to secrecy on her name and her exact income, but she revealed step-by-step and in detail the techniques she uses to generate her online tutoring clients and this outstanding monthly income with her husband as her partner. You'll receive this full 27 minute mp3 audio interview the moment you join. While you may not even desire to earn as much money tutoring online as she does, the system she reveals to you will allow you to generate the part time or full time income you are looking for. I cannot hide this fact so I'll just come out and say it. There is normally a one-time setup fee of $999.00. This is just the usual cost of setting up the account and programming the software to create your own personal virtual classroom and backend system. But since you took the time to read all the details that brought us to this point and because you're getting into our "trusted online tutoring community" early, I'm going to discount that fee for only $199.00 as long as you agree to share your success story with me and other online tutors inside our members only forum. Less than $200 will get you started on the road financial independence. This price barely covers our costs to get you set up. But that's not all you'll receive...far from it! Along With Taking A Full $800 Off The Price Of Registration, You'll Also Receive A Bundle Of Valuable Bonuses Absolutely Free! Bonus #1 - Let's start with exclusive parent leads who requested information about your online tutoring business. Yes, that's right! We find parents who want to pay for your online tutoring services. And we are going to train you to call them. Don't worry about selling! You'll never be doing that and if you find you are, you'll be doing something wrong. Your parent leads will include Subject, Grade, Parent Name and Phone Number. Each parent will be waiting to hear from you. They'll be looking forward to learning about your online tutoring service. Bonus #2 - Instant access to TutorFi's Fill Your Practice Training. This is our "membership only" area created from seven years of online tutoring experience while operating eHomeworkHelp.com, Live-eTutor.com and OwlOnlineTutoring.com and TutorFi.com. The information inside this website is guaranteed to explode your online tutoring business. This is a proven way to acquire as many clients as you want. Bonus #3 - Your own customized website guaranteed to generate more parent leads than any website you could purchase or create yourself. Before any parent contacts you directly, they'll want to know a little bit about you. Your website will allow parents to see what a true professional you are and it also offers a How To Motivate Your Child report as a special bonus and extra reason for parents to inquire about your online tutoring service. Bonus #4 - A quick and easy way to add web pages to your website and place each of your new web pages in front of parents every day. Many of those parents are in need of a tutor and will contact you directly. This method alone can support your online tutoring business for years to come. Bonus #5 - Extra Recommended Training Section was created specifically to guide you following a consultation with Gretchen. If she feels one of these extra lessons can help you now, she'll recommend it. This is a faster way to build or expand your business vs the orderly process of our Fill Your Practice Training designed to help you build a long term business you can count on for years to come. The extra recommended training will help you get results fast if you qualify. Bonus #6 - We'll then set you up with your own business email address "yourname@TutorFi.com". This instantly brands you as a professional and keeps your business life separate from your private life. This alone comes with a value of $49.00 per year, but you get it FREE for the entire lifetime of your business. Bonus #7 - You'll also get a FREE subscription to our exclusive quarterly enewsletter. Learn what's hot in the tutoring industry. Follow trends. Discover what disciplines are in desperate need of your experience. Bonus #8 - Special video training & script designed to help you comfortably speak with parents who are inquiring about your online tutoring service. Working with you and TutorFi is truly my dream come true. From the moment we spoke on the phone, you'll rest assured knowing that I'm dedicated to helping you grow your online tutoring business and achieve your goals. I've been working as an educator for over 40 years and my experience helped me partner with Scott to create our Fill Your Practice Training System that consists of videos and step by step instruction designed to help you get off to a fast start. As soon as you sign up, you'll hear from me directly by telephone and once you start the training, you'll be able to schedule more consultations so you never feel left behind. Let's say you have a 7th grade child and you are feeling desperate one evening after another F came home on his report card. In your mind, you might be thinking that your child lacks motivation, plus you know he's extremely shy and probably never asks the teacher for help. If this was you, chances are, you'd want to help your child overcome this lack of motivation and shyness. Where would you turn to? In today's society, many parents turn to the search engines as a starting point. Before the internet age, there was no where else to turn to for quick answers. Now, Google alone receives over 300 million searches per day. We can both agree that those numbers are hard to fathom. What do you think these people searching for? What if you could give them the information they are searching for? Our goal is to get your website (the one we provide you with) listed on the top of all major search engines under dozens of different keywords that parents would be searching for when it comes to helping their child improve academically. Getting back to the example above, if you were that desperate parent and you searched on Google.com with the words, "how to motivate my shy child". Here's what you would find. That top listing in google is just one of the hundreds of articles on our TutorFi.com website. When you click to read the article (click here if you want to view it), I am sure you'll agree that we are providing great information for any parent who is trying to help their shy and unmotivated child in school. Would you agree that if you were the parent you'd be thankful for this information? Most parents are thankful and many of those same parents click to view the website of the person who wrote the article. This is our #1 strategy to help our TutorFi members generate parent leads. This is just one of many proven techniques we use to help our tutors succeed. Our new partnership with Sarah Wozniak our seo expert will help your website generate free clicks and most importantly, inquiries from parents who are interested in your online tutoring service. This strategy alone will help you generate leads now and into the future. This is the one bonus that we threw in to guarantee you don't get left behind. You'll have access to 3 different TutorFi practice buddies who'll help you master the art of online tutoring, even if you are considered computer illiterate. No Tutor Gets Left Behind! When you start our Fill Your Practice training program, you'll notice real quickly that we focus on helping our tutors MAINTAIN MONTHLY ACCOUNTS for years to come. We do this by simply over delivering so much that your client wouldn't dream of stopping your service for fear that A. They could and would never find another tutor who'd compare to your service. Not to mention the fear of you not having a slot available if they return. Click Here To Get Onboard! We handled all business aspects of ehomeworkhelp.com, live-etutor.com, owlonlinetutoring.com and now TutorFi.com with integrity and honesty. Our 30 + years of teaching in schools and running online tutoring businesses have been invaluable to us, and they are guaranteed to be invaluable to you, too. This is everything you need to be successful at a price you can afford. You're actually getting $5372.00 worth of value from TutorFi for only $199. If you tried getting all these resources from other online tutoring companies, website designers, search engine optimization specialists, tech support and lead generation companies, you would expect to pay at least $5,000. The reason we can offer this type of savings is because my team and I work from home and we don't plan on hiring extra help or moving into an office. This helps us control our spending and by doing this, we can save you money. The plan I laid out above is a result of 8+ years of work in the online tutoring industry. With all this being said...I HAVE TO WARN YOU. THIS MIGHT BE YOUR ONLY CHANCE TO JOIN! We can only guarantee availability "IF" your city or town is not already taken. Unfortunately, this is first come, first serve. If by chance your town is taken, you'll have the option of being offered a neighboring town. To clarify why this matters so much, it's our goal to help you rank at the top of the search engines for the keyword "YOUR TOWN TUTOR". When a parent in your town types those words into the search engine, many will click your website and contact you as a result. Our goal is to help you become the #1 choice of tutoring in your town as you generate leads month after month. If your main town is already taken and you are forced to take a neighboring town, we can still help you succeed, but branding you as the best tutoring option in your town would be much easier. Either way, your local search engine rankings will generate leads for ever and ever. This is why it's important to CLAIM YOUR TOWN NOW WHILE YOU STILL CAN! If you take action now, for only $199, you can start something that will change your life forever and we'll be with you every step of the way! Start your own tutoring business. Become part of TutorFi.com family. Together, we'll help as many students as possible. Put in just a few hours a week. Earn extra money while helping others no matter where you live. You provide the desire. We'll provide the system. You profit while helping others. The work you are doing for us in creating this company offers some of us the answer to prayers uttered in silent moments when we seek new directions and new ways to serve effectively. Thank you for the tenacity to keep trying with your dream; as a result, you are bringing some of our fondest dreams within reach. I was simply thanking you for the wonderful services you provide at Tutorfi.Â You promptly addressed my concerns,Â provided the extremely useful Fill Your Practice training lessons and offer coaching with Gretchen.Â TutorFi isÂ well worth the price. Everything is excellent! This program has exceeded my expectations and although I have not started tutoring I have been involved in at least twenty different on line businesses over the past 12 years. I can tell you that this is the best I have ever encuntered as well as the most user friendly. The things that are espousedÂ on your web page are true and you certainly seem to care about the success of each tutor sans personal gain. Your system has given me encouragement to try something new. Not only can I use the skills I've acquired over the years to help students, I will also be able to do something I truly love--teach! Thanks again for what you've done. Keep up the good work; may you continue to find success now and in the future. You're receiving the opportunity to become the tutoring juggernaut of your town while paying almost nothing for overhead. With this being said, and in a very short period of time, I will be raising the price to $199 monthly, but for any tutors who sign up now, you'll be GRANDFATHERED in at the $97 per month price. Why am I raising the price to $199 you ask? Because we are about to embark something bigger than I ever dreamed. Once a Tutorfi tutor is certified, they'll be placed into a pool where each tutor will qualify for our "client give away program". We're going to use tv advertising, radio advertising along and online advertising to brand TutorFi tutors as the best possible option that any parent could ever make for their child. Needless to say, advertising is not cheap and that's why I'll be raising the prices. But the good news is that each tutor who qualifies will be eligible to receive clients. When this happens, my dream to help tutors, parents and students will be complete. Tutors like you will be earning the type of money you've always wanted while teaching the way you know works best. On top of this, you'll be appreciated. Parents won't believe how you over deliver and consult with them about their child's academic needs, wants, hopes and goals. Your students will finally have a tutor who they appreciate while you teach them in an online environment they love. When I first got started with my business, it was like an adventure to learn and understand all the ways I could spend money on my business first BEFORE I paid my taxes. I have to say, the government and IRS got this one right. They want you to start a business and become successful. You can start a Sole Proprietorship for nothing, PLUS you are still entitled to most of the same tax deductions as someone who incorporates. Not only is your entire start up cost and monthly fee deductable, but you can also deduct meals, entertainment, travel and more as long as you are conducting business along the way. Here's how you can get money back...IN FACT, I DID THIS VERY THING! If you are using existing home office equipment to start your online tutoring business, you can actually go back in time and deduct all these expenses. This includes office furniture, space, electric, computers, printers, phones and more. Of course you'll want to consult a professional accountant on this stuff, but if this is the first time you ever started a business, you'll be pleasantly surprised how the IRS structures taxes for sole proprietorships and even companies if you start one down the road. TutorFi was designed to be a true win/win situation. And I'm willing to take the risk for you...if you're willing to put in the effort. As I stated in my video, if you don't do the work, there is no way you can be successful. On the flip side, if you do the work and complete our Fill Your Practice Training program, there is no way you can't help but be successful. Note: Our coaches are instructed to NOT let you skate through a lesson without doing the work exactly as we expect you...a true professional online tutor to do. This training program will make you successful, but you have to follow the lessons. PS - Let me remind you...this system could easily make you an extra $18,000 per school year tutoring from home only six hours a week! That means you get your summers off to do whatever you want. Vacation, home improvements... it's all up to you! Even if you decide to tutor this summer, you can now do it from anywhere you have an internet connection. PPS - I can't stress how limited this offer is. Claim your town or city now and guarantee yourself a steady source of local leads for years to come.